Military memorabilia and collectibles continues to be an area of great interest to collectors. Original wartime items such as weapons, medals, field gear, flags, uniforms, etc., can be very desirable. 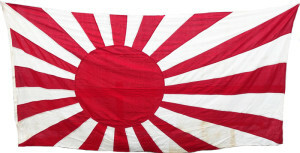 We recently sold an original World War II Imperial Japanese flag from the battleship Nagato for a client for $1,800. The Nagato was the flagship of the Imperial Japanese fleet during World War II, and was the lead ship of her class with unmatched speed and armor capabilities. The Nagato was infamous for serving as Admiral Isoroku Yamamoto’s flagship during the attack on Pearl Harbor. Participating in a number of naval actions throughout the war, the Nagato was attached and seriously damaged in a U.S. bombing raid but survived until 1945 to serve as the last official site of surrender for the Imperial Japanese Navy. By this time, the Nagato was one of the only major Japanese naval ships still afloat. Upon surrendering, the Nagato was boarded and secured by American sailors from the USS Horace A. Bass and all Imperial flags on board were confiscated by the crew. This particular flag was obtained by a sailor, William F. Wilson of upstate New York, who passed it down to his descendants. The Nagato was too well-known of a ship to survive the end of World War II. For fear of it coming to represent a rallying point or a shrine for the Japanese, the United States Navy elected to tow the heavily damaged and limping Nagato to Bikini Atoll and sink it during a series of nuclear weapons testing known as Operation Crossroads. 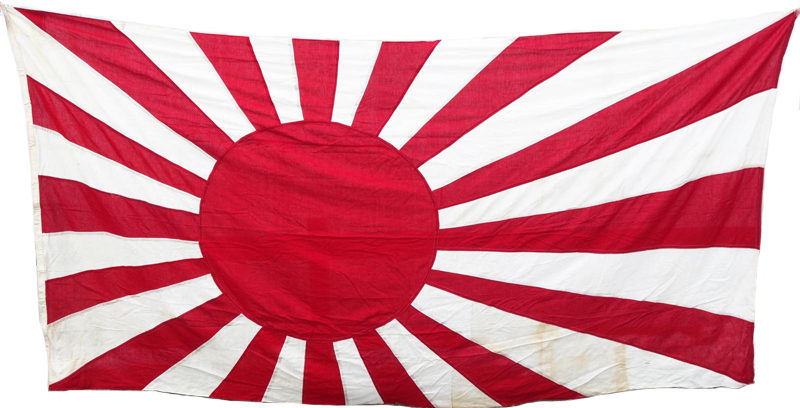 Our client’s flag was a very nice example of an Imperial Japanese naval ensign and war flag with the traditional off-set Rising Sun design. The flag came to us in great condition with the original rigging lines, and measured an impressive 134 inches by 69 inches. Militaria is an interesting area of collecting with a wide range of eras and items to explore. Military items from around the world are often brought back when soldiers return home. We’re always excited to see wartime memorabilia, particularly when accompanied by family histories or records. If you have a piece of militaria, read more about selling to us, or contact us to set up an appointment.